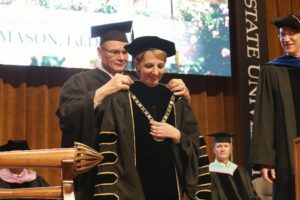 HAYS – Proclaiming a theme of “Unlocking Untapped Potential,” Dr. Tisa Mason was inaugurated today as the 10th president of Fort Hays State University in a ceremony in Gross Memorial Coliseum at Fort Hays State University. Welcome everyone and thank you for being present today as we celebrate this remarkable university. Throughout its 116-year history, Fort Hays State University has been blessed with a community that consistently rallied its support around her, a committed faculty and staff, engaged students, and a strong legacy of presidents. It is on the shoulders of the nine presidents who served before me – as well as Regents, legislators, civic and business leaders, and alumni – that we share this privileged journey forward. Our theme today is “Unlocking Untapped Potential.” I hope that phrase resonates with you as strongly as it does with me. It is a refinement of our mission and our vision, our past and our future. The specifics may change shape, but that vision remains. It is why we exist. Together, all of us are here to unlock the untapped potential of our students to empower our campus, our community, and our world for even greater success. Today, innovation at Fort Hays State University looks like Logan. Innovation looks like Leadership 310 teams bringing community-changing service-learning projects to every corner of the globe. Innovation looks like the Forsyth librarians teaming up with faculty from new media studies to give access to modular smart classrooms that will enable students to stand inside life-size 3D models, to manipulate interactive data visualization, and to experience interactive exhibits where students can walk through history or a virtual art gallery. Innovation looks like a state-of-the-art applied technology building, where students are learning the latest in metalworking, robotics, electronics and more. Innovation looks like our Maker Van, promoting STEM learning opportunities for students and teachers throughout Western Kansas. And that just scratches the surface. Fort Hays State University truly is transforming students through innovation in education. We are creating a ripple effect that spreads throughout the state of Kansas and ultimately impacts students, families, industries, and communities around the world. Today is a formality, but it is not a celebration of me. It is a celebration for us – an inauguration not of a person, but of an institution. Today is our opportunity to pause and reflect on the things that make Fort Hays State University so special: Our spirit of hard work. Our remarkable community. And our enduring legacy of innovation.